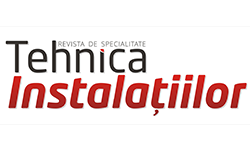 Tehnica Instalaţiilor is a magazine primarily aimed at those directly involved in the HVAC-R domain, be it production, operation, regulation or installations related services. It is designed for companies, engineers, consultants, technical experts but also end-users, including in its pages articles written by professionals in the field, news, impressions on events of its kind in the country and abroad, articles, presentations of products and companies, opinions, so as it represents a landmark for anyone intersects with the installation work. Currently, Tehnica Instalaţiilor is the specialized magazine with 8 issues per year, with free subscription and supplements for electricity, green energy and water, both in the written form and online through InstalNews.ro.